This was our second real big photoshoot together with Roxy Photography! This time we were used to each other and the results are so so so great. I can say that this is my favorite photoshooting ever until this day. The pictures she took with her lightning equipment are so cool! I can't describe how much fun we had even though this warehouse was so friggin' cold in november, I nearly died. We took hundreds of pictures and it was really hard to sort them out because many of them turned out so awesome! I especially love ... ahh I love all of them. Our inspiration for this shoot was the confinement of Licht and Hyde during the Greed Arc and their fight which ended in them accepting each other and becoming a kickass team. 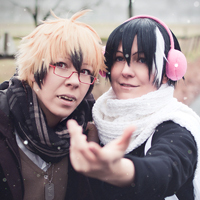 Servamp - XMAS Greed Pair Our collection of Instagram/Twitter only christmas and winter greed pair pictures! Servamp - Halloween Greed Pair Halloween time! 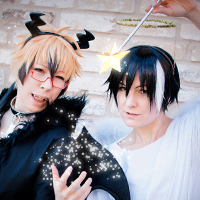 We spontaneously decided to do the Halloween version and took some angel and demon pictures on Halloween. 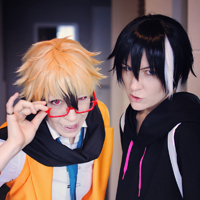 Servamp - Domestic Greed Pair We decided to have a home sweet home shooting as our favorite angel and demon! 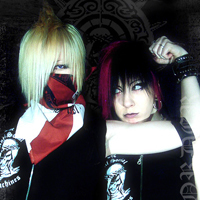 The GazettE - Disorder It's been our dearest wish to cosplay Reita and Ruki together because we really came to love them over the past months.